This is such a great idea to stretch the use of our markers. For today's card I started by sponging a small panel of cold press watercolour paper with distress inks. Blue near the top, green at the bottom, and soft yellow in the middle. I took a wide, wet paint brush and went back and forth across the watercolour paper to activate the ink and blend the colours. This creates a watercolour wash background. I blotted here and there with a paper towel to lighten the colour a little before drying the panel with my heat tool. I placed my tree image and background in my Misti and inked up the trunk and branches with a medium brown zig. I spritzed a few times with water and stamped onto cold press watercolour paper. Held it for a few second and then opened up my misti. I spritzed more water as I thought the ink was a bit dry looking and then stamped again. I cleaned off the stamp and next inked the leaves with two shades of green (bright and dark) zigs. Spritzed with water, stamped again, and then took the piece out to dry. 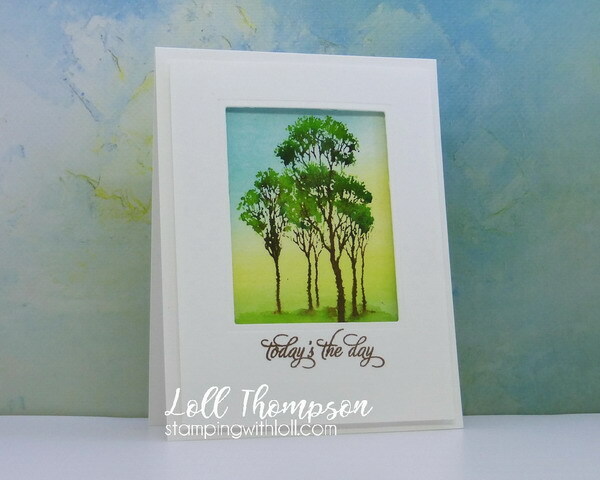 I adhered the watercoloured panel to my card base and then popped up a white frame with a stamped sentiment on top. I hope you'll check out the challenge blog to see the amazing cards from the rest of our Designers, along with our Guest Designer this month, Chrissie (Simply One of a Kind). I know you'll be inspired. Then come join us. We'd love to see you in our gallery! I love how you created the watercolor wash for your background, Loll...you added a glow to your design and set the stage for these gorgeous trees! 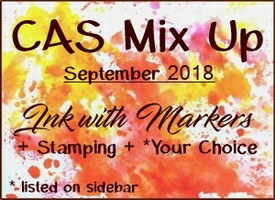 Great idea to use your Zig markers, too...I don't use mine nearly enough, but I will for this challenge :) Thanks so much for your inspiration...I can't wait to play along again! Oh Loll, this card is so magical !!! This is one of the most beautiful of your cards! It has such an amazing atmosphere, color and misty atmosphere. WOW! I can not stop looking at her! I have been admiring your trees, Loll, and I love them even more seeing a close up! Love the background with the varying shades and how adding water makes it a masterpiece! Love these trees too! Just what just hopped in my basket? LOL! This one jumped off the page at me. 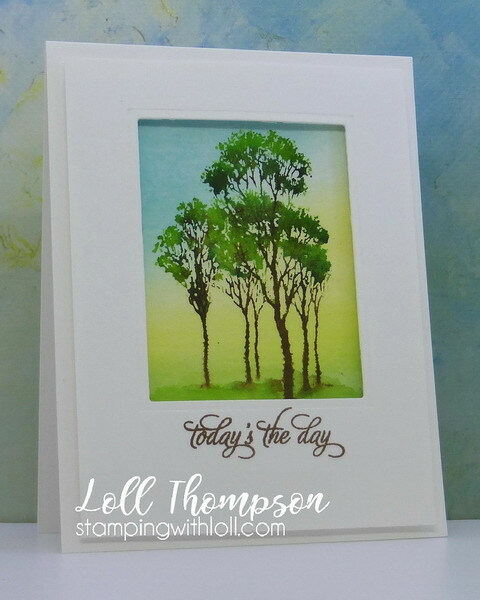 Love the idea of sponging on watercolor paper and wetting that for such a perfect gradient. I've never seen a tree stamp I didn't have to have and this is no exception. I have a strong suspicion I'll be hunting that one tonight. LOVE this! I meant sponging* I should have paused before pressing ENTER! A beautiful and serene little grove of trees, Loll. Wonderful background, soft and soothing and beautiful trees. The technique creates a lovely scene. Thank you so much for sharing! Beautiful background and even more beautiful grove of trees - your marker colouring in the two shades of green gave them real dimension. Such a lovely card! Gorgeous background and the shading on your trees is lovely. Loll. Such a beautiful scene. That background wash is so beautiful. The trees against that background are lovely. I'm going to try this and see what happens. May surprise myself! The sample cards for the challenge are awesome. beautiful card...I really want to try and play too. Your sponged sky looks wonderful as a background to the trio of trees. What a super job you did on the trees too. I like the look that you've achieved at the mid-point with the sort of yellow-green area...it created such a nice glow of sunshine coming through the tree-trunks. And the scene looks so pretty framed like you've done! TFS & Hugs too! Your cards are always stunning skill and this is no exception, it’s a dramatic use of colour within a limited palette! It’s great to be joining you this time! Stunning card Loll - love how the image has stamped so well over the water colour wash. This technique is a bit tricky - you want enough water but not too much! Your trees came out beautifully! and look fantastic on the sponged background! Gorgeous Loll. I really must try this technique again, last time I just ended up with a mess! Stunning! I love the framed scene! A beeeeeeeeeeeautiful crop of trees here Loll. That background is stunning! I love how you have done this card Loll, those trees look magical and that background colouring just perfect. Wonderful design.